Susie Hodge is a familiar and respected name in the world of art history publication. With a talent for organization and breaking down a massively complex discipline into bite sized relatable bits, Hodge follows up a previous project The Short Story of Art (2017) with The Short Story of Modern Art. Both books have as their subtitle: A Pocket Guide to Key Movements, Works, Themes, and Techniques in Art. In the process of reviewing the current publication, The Short Story of Modern Art, there came about many flashbacks to the review for The Short Story of Art that was written here in May of 2017. One could just as easily insert the new title into the 2017 review and change an example or two and the assessment would stand solid. These two books are structured in the exact same format, to great effect. Which brought up a good and reasonable question: What is the difference between these two books and why should one consider the 2019 book if the 2017 book is already in one’s library? First, the similarities hit three main points. They are both introductory surveys of a large span of art history presented in a diminutive format. They share the same detail-oriented organization system that allows for an Internet style of surfing as one flips from section to section as if clicking on link after link. And Hodge’s enthusiasm for the topic is unabashedly contagious. Second, the differences, posed alongside the first two similarities. The Short Story of Art covered all of art history from 50,000 BCE to the Conceptualism of the 1960s. 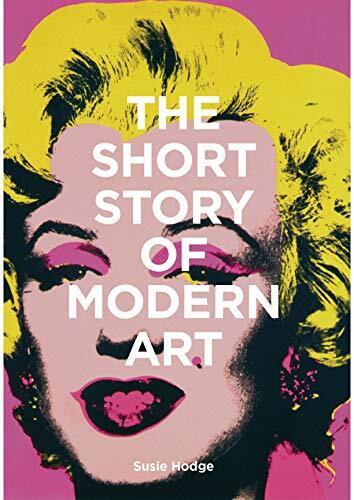 The Short Story of Modern Art starts around 1830 with Realism considered to be the “first art movement to denounce traditions that had been established by official art academies . . .” and concludes with the Young British Artists of the 1980s and 1990s (these being British publications, this makes complete sense). The two books do overlap in that they consider almost all the same movements from Realism forward. Fortunately Hodge did not just cut and past her content from one book to another. She re-thought the concepts and re-phrased her ideas so that the two versions would complement each other, not repeat each other. The common organization technique is a welcomed familiar friend. While much of the information about the artists who serve as representatives of the various movements, themes and techniques is similar, the artwork Hodge selected is completely different. For instance, The Short Story of Art uses Piet Mondrian to demonstrate the Neo-Plasticism movement via Broadway Boogie Woogie (1943), which is, in turn, highlighted as a key work in The Works section. The Short Story of Modern Art also pinpoints Mondrian as a leader in Neo-Plasticism but targets Composition (1921) and Composition in White, Red and Yellow (1936). Readers of both books will enhance their understanding of this movement, artist and the place of the artwork in the big picture of art history. Holding both books side by side allows for easy and insightful cross comparisons that would not be possible if Hodge had tampered with the organizational elements. A final comment on Hodge’s approach is that both books encourage the reader to pursue the field of art history. Her down-to-earth style of writing encourages relationships with these artists, and further exploration into whichever direction a curious mind is led. The books build upon each other in an exciting and engaging manner. The Short Story of Modern Art will allow the reader to feel more at ease, more confident, and more educated about the world of art.